Select lean pieces of meat and remove as much of the visible fat as possible. Next, marinate the meat for at least 40 minutes before cooking, as this will neutralize the oxidative damage of cooking at high temperature. Another alternative is to partially precook the meat in the microwave oven in order to eliminate its juices and then to finish cooking it on the barbecue. You should also avoid overcooking meat. This can be easily done by using a cooking thermometer. When the temperature reaches 63°C (145°F) for steaks, 71°C (160°F) for ground beef and 74°C (165°F) for chicken, this means that they are sufficiently cooked. 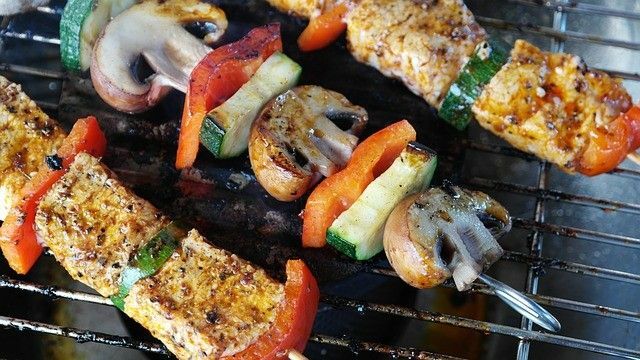 You can also occasionally try out a vegetarian barbecue, as it is less fatty than meat. Remember however that the charred portions of vegetarian dishes are no less poisonous. And finally, don’t forget dessert: For example, skewers of fruits brushed with a bit of honey and grilled! Originally published in the Journal de Montréal on May 21, 2011.